Our study showed that the SA node is a small mass of transformed cardiac muscle. Department of Basic Sciences, Faculty of Veterinary Medicine, Karaj branch, Islamic Azad University, Karaj, Iran. BACKGROUND: Caspian miniature horse is an Iranian breed of the horse. Some anatomical studies such as topography of the heart have been conducted in recent years. OBJECTIVES: Regarding the importance of SA node in regulating the rhythmic contraction of heart, the present study was performed to demonstrate the position of the SA node and its arterial supply. METHODS: 4 excised hearts of Caspian miniature horse were used for this study. The coronary arteries in two horses were injected with a mixture of gelatin and choromopaque and the other two with colored rodopas. The gelatin injected specimens were used for contrast radiography and the rodopas injected specimens were macerated in HCl and the cast studied for arterial branches. Terminal sulcus and location of SA node was macroscopically detected and separated for histological investigation. 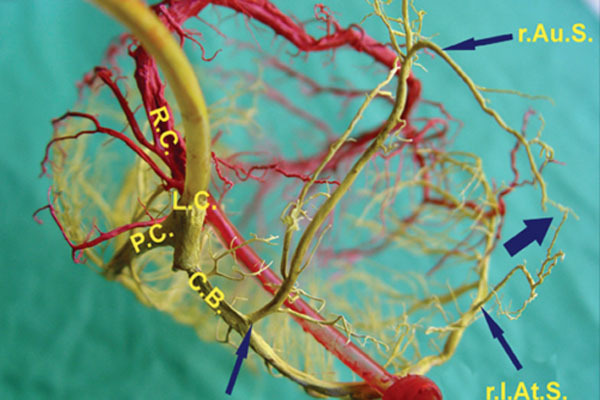 RESULTS: Our study showed that the SA node is a small mass of transformed cardiac muscle. It is situated under the epicardium of the right ventricle between the cranial vena cava and the right auricle. The blood is supplied by a few branches separated from the right auricular branch of the proximal branch of left atrial artery. The latter itself is a branch of the left circumflex artery of the left coronary artery. CONCLUSIONS: This study revealed that there is no difference between caspian miniature horse and the standard horse.